Yu-Gi-Oh! 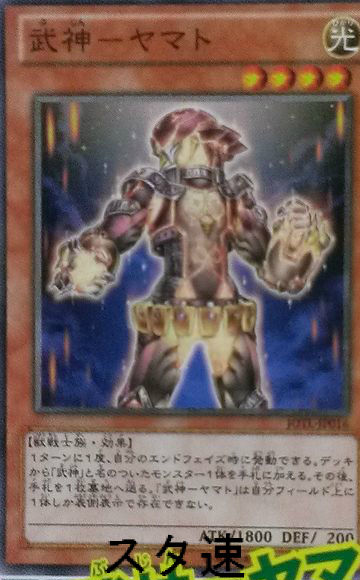 Behind the Cards: Bujin / War God | TCG, shiyo? After a long break I’m finally back with my latest look at the stories and mythology behind Yu-Gi-Oh! cards. 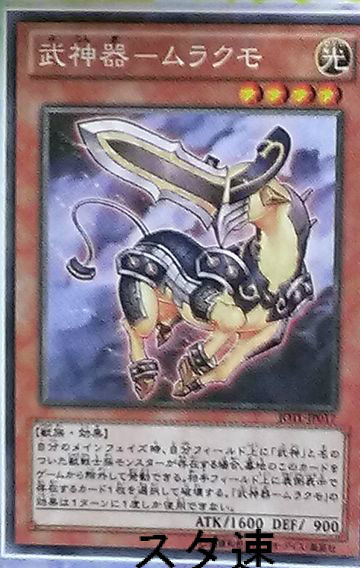 This time I’m going to be looking at an upcoming theme, the 武神(Bujin) or War Gods as some are choosing to translate them. It will of course be a little while before we actually know what they’re going to be called in English though. As you might have realised these are heavily based on Japanese mythology, pulling in a legendary prince, a god, legendary weapons and some of the Tokusa no Kandakara (10 varieties of the god’s treasure). Whilst researching this, I’ve realised that since most of the items the card are based on are old legends, or holy items the public aren’t allowed to see, it’s practically impossible to find images of them. As such I can’t compare them to the cards, like I did with the Mermails. The key card to the deck, and the only actual Bujin so far, is Yamato. Whilst this is possibly just taken from an ancient name for Japan, it is likely based on the legendary Japanese prince Yamato Takeru. This seems quite likely given that we also have a Bujinki / War God Vessel based on the sword he wielded for a time. His story was told within the Kojiki (Record of Ancient Matters) and Nihon Shoki (The Chronicles of Japan), the oldest and second oldest books of Japanese history in existence, which chronicled many of Japan’s myths. There are some differences in details amongst the two, for example in the Nihon Shoki, Yamato Takeru and his father were on good terms, whereas in the Kojiki they clearly were not. 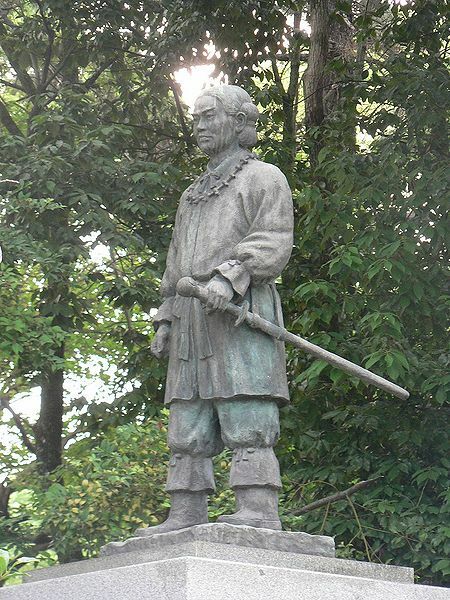 Yamato Takeru was originally known as Prince Ōsu, and was son of Emperor Keiko, the 12th Emperor of Japan. After killing his older brother Ōusu, his father sent him away out of fear of his brutal nature, hoping he would be killed in the process. During his time away he defeated many enemies, earning himself the title Yamatotakeru (The Brave of Yamato) from one of his foes. His father’s mind still unchanged, Kekiko sent him to the eastern lands, where the people disobeyed the Imperial Court. 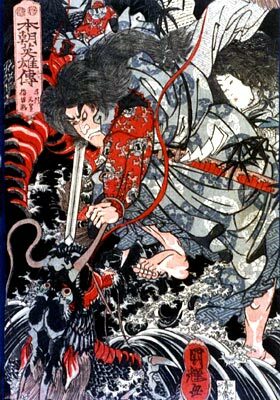 Grieving that his father wanted him dead, his aunt Yamato-hime showed compassion and lent him the legendary sword Ame no Murakumo no Tsurugi, which once belonged to the god Susanoo. We’ll be seeing more from both of these soon enough though, so I’ll save their details for those entries. After receiving the sword he travelled to the Eastern lands and defeated many more foes. Legend has it that during his time there he also composed the first Sedoka (a form of Japanese poem) with one of the old men. He eventually fell in battle with a demon, after ignoring his wife’s advice to take his sword to battle. The anthropologist C.S. Littleton drew parallels between this story and that of the Arthurian legend, suggesting both were derived from an earlier Iranian story. 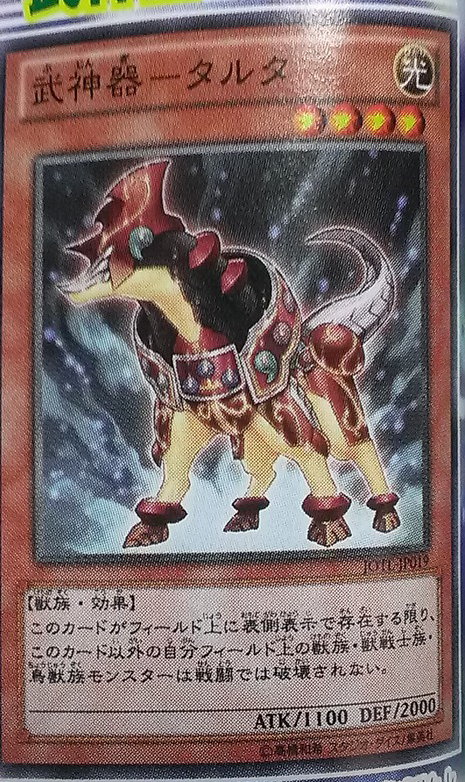 The majority of the War God cards are actually made up of the Vessels, sacred animals which aid Yamato is battle. These are based on legendary weapons or treasures from Japanese history. The first of these is Murakumo, meaning Gathering Clouds, which some of you might recognise as the name of one of the clans in Cardfight!! Vanguard. As you can see from the picture, this is one of Yamato’s swords, and the name would suggest it is based on Ame no Murakumo no Tsurugi (Sword of the Gathering Clouds of Heaven) the legendary sword that Susanoo extracted from one of the tails of the eight-headed dragon Orochi. As mentioned earlier it was later owned by Yamato Takeru, who renamed it Kusanagi no Tsurugi (Grass Cutting Sword) in honour of the time it helped save him against a treacherous warlord by cutting the grass, in addition to its magical ability to control the wind. Some of the readers are possibly aware of the name Kusanagi, because it often appears in games or TV shows as a legendary sword. 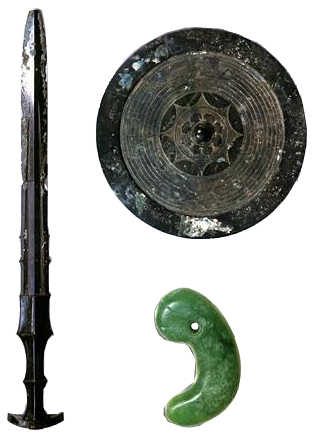 Nowadays it is one of the three Imperial Regalia of Japan representing valour, alongside Yata no Kagami (The Eight Hand Mirror) representing wisdom and Yasakani no Magatama (Eight Shaku Curved Jewel) representing benevolence. None of these items are allowed to be viewed by normal people, traditionally only by the Emperor or specific priests, and as such no drawing or pictures of the real items exist, and some question whether the items exist at all. This means the image supplied above is of course just an artist’s impression of what these 3 may look like. The last time the items ‘appeared’ they were shrouded in cloth, meaning no one could actually see them. Kusanagi is currently meant to be held in Atsuta shrine, but since the priests do not allow anyone to view it, this cannot be confirmed. As the theme expands I wouldn’t be surprised to see the other two Imperial Regalia appear in some form. Our second Vessel based on a sword is Habakiri, based on Ame no Habakiri (Slash of Heavenly Wings), which has many different names including Totsuka no Tsurugi (Ten-hands Long Sword), Ame no Ohabari (Tail-feathers of Heaven) and Worochi no Aramasa. 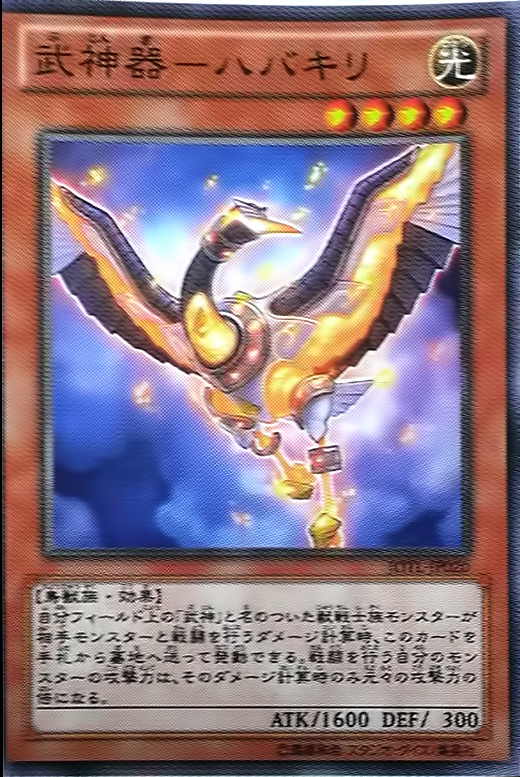 As you can see from the names, they are often to do with birds in some way, so it makes sense that the card itself would feature a bird. As you will see later, it is also capable of transforming into its sword form. The sword was held by Susanoo at the time of his banishment from the heavens. It would later be used by Susanoo to defeat Orochi, cutting off each of its 8 heads and tails. In the 4th tail he discovered the Ame no Murakumo no Tsurugi, which was covered above. Hetsuka and several of the other vessels appear to be based on the ten treasures known as the Tokusa no Kandakara (10 varieties of the god’s treasure) which are enshrined at Isonokami shrine. They were holy items given to Nigihayahi, an ancestor of the Mononobe clan, by Amaterasu and brought to earth when he descended from Heaven. These treasures were essentially magical items that could be used in rituals for the purpose of exorcism or purification. Hetsuka appears to be based on Hetsukagami (Mirror of the Shore), which was possibly a mirror that brought glory. This is reflected in the design of the card, which features a turtle-like animal, which could live by the shore, with a mirror on its back. Taruta is based on another of the Tokusa-no-Kandakara, this time the Tarutama (Jewel of Plenty). This is apparently a jewel which makes armour it’s form, which I suppose means it turns into armour? 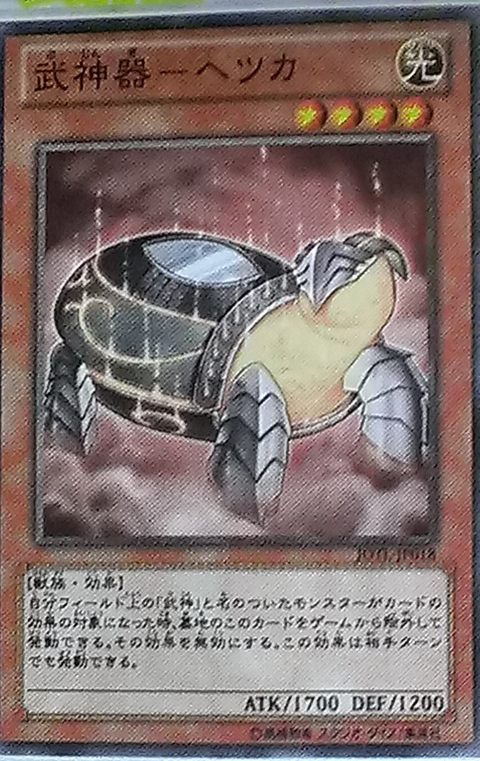 Taruta features many jewels on his armour, mostly different coloured magatama, which I suppose is a faithful representation of the treasure and what it can do. Whilst it would be easy to assume that this card is based upon the mighty dragon Yamata no Orochi, the design of the card, and the function of the Vessels in general lead me to believe otherwise. Firstly the Vessel only appears as a one-headed, one-tailed dragon, rather than with the 8 possessed by the legendary dragon Orochi. Secondly, all the other Vessels are weapons or treasures that are meant to help Yamato to become Susanoo, so why would one of them be one of Susanoo’s enemies? It makes much more sense if this Orochi were based off another treasure, and fortunately one exists, Orochi no hire (Snake[-repelling] Scarf), which is another of the Tokusa-no-Kandakara. This one either repels snakes, or helps heal wounds inflicted by snakes. To me this fits, because this Vessels seems fairly scarf-like in its appearance. Our final War God card is their most powerful monster, their Emperor Susanoo, who is based on the god of the storms, of the same name. 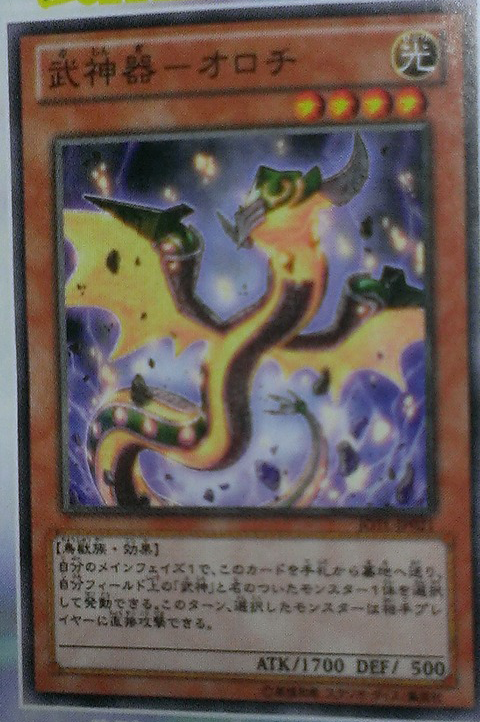 He’s previously appeared as the Spirit monster Susa Soldier, but is now back as the trump card in a new deck. He is the Shinto god of the sea and storms, and is also considered to be the ruler of Yomi, the land of the dead. He was born from Izanagi’s nose, when Izanagi cleansed himself of the pollutants from Yomi. He is the brother of Amaterasu, the goddess of the sun, and Tsukuyomi, the god of the moon. Tsukuyomi at least should be familiar to current players, since it’s probably the 2nd most famous Spirit monster in the game after Yata-Garasu. Susanoo had a long standing rivalry with his sister Amaterasu, which eventually culminated in him destroying her rice-fields and killing one of her attendants. This lead Amaterasu to hide in the Ama-no-Iwato (heavenly rock cave). Even though she eventually left the cave, Susanoo was banished from Heaven as punishment. He descended from Heaven to the province of Izumo, where he met an old couple being tormented by the dragon Orochi, who had eaten 7 of their 8 daughters. In exchange for the hand in marriage of the final one, Kushinada-hime, Susanoo fought and defeated Orochi, by getting all 8 of its heads drunk. As he was chopping Orochi apart with Ame-no-Habakiri, he discovered the Ame no Murakumo no Tsurugi, which we have both already encountered. The latter was presented to Amaterasu as a reconciliatory gift, and eventually made its way down to earth via her descendant Ninigi along with the other Imperial Regalia. The theme ties all of the cards together in War God Emperor – Susanoo, linking in the legendary items and the legends of Yamato Takeru and Susanoo. Susanoo the card, is an upgraded version of Yamato, dual wielding the two swords that at one point belonged to the god Susanoo, which makes sense, given that one of them belonged to Yamato as well. The Tokusa-no-Kandakara then form some of his armour. The remaining War God support cards merely seem to be related to the cards, rather than the legends, barring War God End, which features the banishing of Susanoo from Heaven. 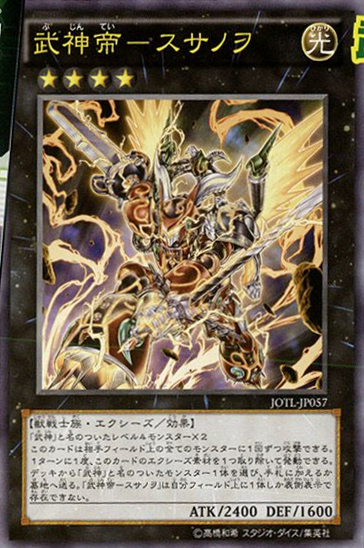 Its name Bujinyarai appears to be derived from Kanyarai, the banishing of Susanoo from heaven, which is clearly shown in the card itself. This is also partly reflected in the effect of the card itself, where you get rid of a War God on your field. 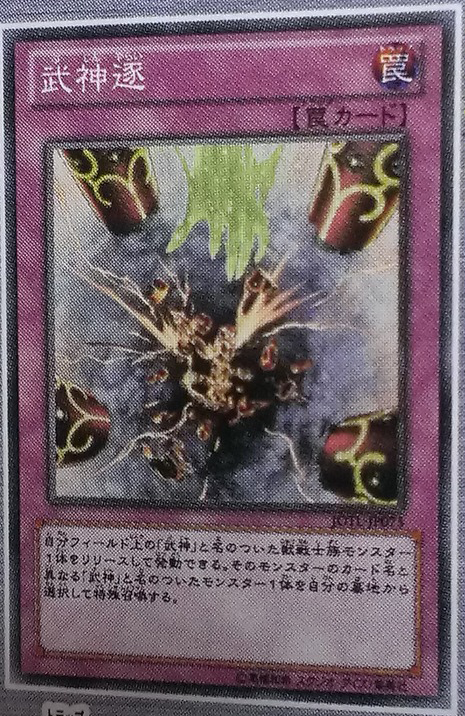 The Bujin / War Gods are an interesting archetype that calls upon Japanese folklore and holy items for its inspiration. They’re all linked together quite well, and still have plenty of room for expansion, with more Imperial Regalia to go, and the rest of the Tokusa no Kandakara. Beyond this there are also plenty of other legendary figures and gods to call upon, so it by no means has to be a one set archetype. Hopefully this little venture into the mythology of Japan might inspire you to look a bit further, and maybe consider the stories behind the many other Yu-Gi-Oh! cards that draw their inspiration from the same source.